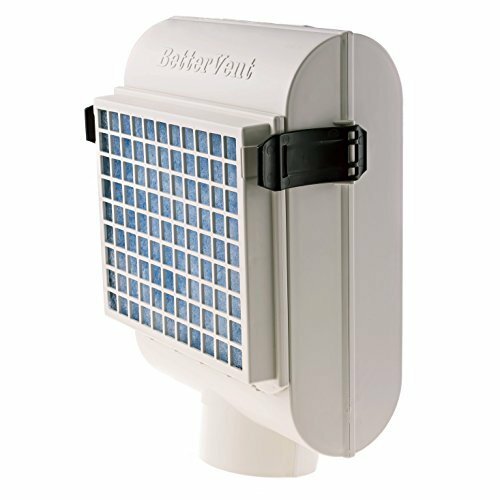 This indoor dryer vent is designed to capture the lint from your electric clothes dryer, for those unable to vent to the outside. All types of indoor dryer vents will allow heat and humidity into the room. We recommend the user allow for air circulation and ventilation when operated in confined spaces. This patented double filter system does not use water, eliminating messy cleanups. The stainless steel screen acts as a pre-filter capturing large lint particles, pet hair, etc. and can be cleaned with a sweeping motion of the hand. The polyester filter will capture the finer lint dust and can be vacuumed clean for extended use or replaced when fully loaded with lint. Replacement filters are available in packages of 6, lasting most users up to a year under normal conditions. There is a patent pending "safety vent flap" designed to open, as a reminder to clean the screen and filter. For renters or homeowners concerned with dryer lines that exceed the dryer manufacturer's recommendations, resulting in inefficient operation and lint accumulation, this is a great solution. Saves energy in colder months by returning warm dryer air into the room. All installation hardware included. Customer supplies hose and clamps. Installation is quick and easy, instructions included. If you've purchased this product in the last 30 days and one or both of the side clips is broken, please reach out to info@supplykick.com for a replacement. INDOOR DRYER VENT - Indoor lint trap for electric dryers that does not use water. ENERGY SAVING - Clothes dry faster, saving time and energy. TRAPS LINT - Double filter system captures lint and dust for healthier indoor environment. SAFETY ALERT - "Safety Vent Flap" alerts user of the need to clean/replace filters. If you have any questions about this product by BetterVent, contact us by completing and submitting the form below. If you are looking for a specif part number, please include it with your message.